Dear Reader, I learned some important things the hard way this week, so I thought I’d share the fruits of my agony. I’m used to letting IIS handle the details of hosting a web service for me, so I wasn’t familiar with the ins and outs of netsh. If you self host with OWIN, this apparently gets taken care of for you – so you don’t need to worry about it. If you self-host with ServiceStack (like I did) be aware that ServiceStack uses HttpListener. The basic idea is the operating system needs to make sure a given user has permission to start listening for network requests before it’ll actually pass the network traffic to the listening application. In fact until you configure this correctly, your service will never get hit, but calls will return with a 503 error. netsh http add urlacl url=http://+:9001/ user="NT AUTHORITY\NETWORK SERVICE"
I also had no idea that netsh was so finicky. For example, there is a significant difference between urlacl=http://+:port and urlacl=http://*:port - one reserves any untaken IPs, the other reserves all known IPs. When viewing the certificate in the browser, if you think pressing the ‘install certificate’ button will make your cert problems go away, you’re mistaken. 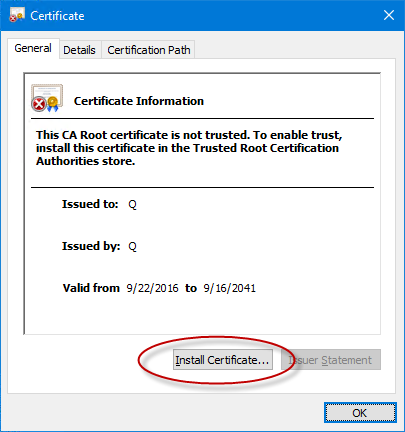 Instead, you need to open Microsoft Management console, add the ‘Certificates’ plugin, make sure you choose ‘Computer account’ (in the “this snap-in will always manage certificates for” dialog) and THEN install the certificate to the ‘Trusted Root Certificate’ store. More information on Jeff Sander’s blog. Using this method, I was able to easily see a certificate validation error with a self-signed cert that I was using. Without it, I was flying blind.